When photography enthusiast Martijn van Oers stumbled upon an original 1929 Zeiss Ikon 520/2 medium-format camera at a second-hand store, he didn’t expect to find an old roll of used film inside. 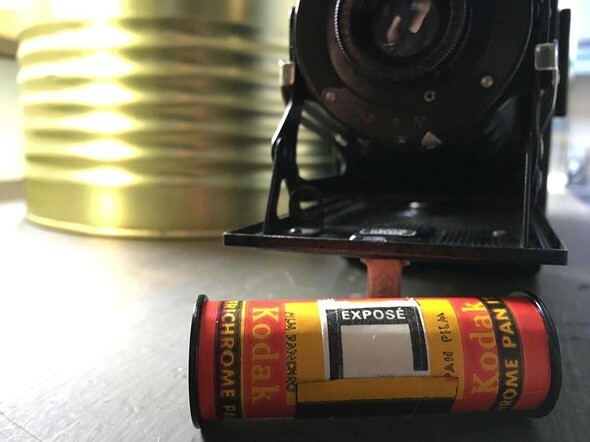 The film, marked only with the word ‘EXPOSÉ,’ was made between the 1940s and 1970s, and the roll didn’t provide any clues about what lay hidden inside. As Oers explains in a recent post on Bored Panda, the roll of film was successfully developed with the help of his friend Johan Holleman. Only four of the resulting photos contained enough detail to discern anything about the film’s history, but it was proven enough. Operating on a tip from a contact, Oers compared the photos to Google Street View imagery and determined that they were likely taken in the French city Biarritz. Oers shared scans of the photos with the public; two elderly individuals, one man and one woman, are visible in them, though both people remain unidentified. We spoke to Oers briefly, and he seemed thrilled by his find and all of the attention the photos were getting. And while you might think he plans to put the camera on a shelf as a memento, that’s not actually the case. He tells us that, while he normally prefers to shoot Nikon, he plans to start using the 1929 Zeiss Ikon camera as well. Check out the final images and behind the scenes shots in the galleries above, and then head over to Instagram to see more of Oers work. All photos courtesy of Martijn van Oers and used with permission.